Part of what made Jordan Peele’s directorial debut Get Out such a treat was the way it defied typical genre expectations, throwing practically everything and the kitchen sink at its audience. As a more traditional horror film, Us feels practically tame by comparison, offering scares that wouldn’t seem out of place in an entry into the Halloween or Nightmare on Elm Street franchises. For a director as innovative as Peele, the confines of staying within horror’s established norms might feel constraining, but the talented director has a way of captivating with whatever material he chooses to work with. Peele takes something as benign as a carnival funhouse mirror and turns it into an object of apprehension. Adelaide is a girl haunted by her experience of walking into one late one night, discovering something that felt like more than a reflection. Years later, with a loving family, she finds herself continually reminded of the night, fearful of repeating the terrifying events. Us is the kind of film that demands a lot from its actors, with each tasked with playing the doppelganger version of their characters. Lead actress Lupita Nyong’o handled this job exceptionally, carving out distinct identities that played well against each other. Nyong’o is a very expressive actress, often using gestures and expressions to convey emotion rather than simple words. The film’s child cast, including Madison Curry, Ashley McKoy, Shahadi Wright Joseph, and Evan Alex give strong performances that demonstrate a refreshing sense of comfort for young talent in a horror film. While Peele is an Oscar-winning screenwriter, he uses dialogue sparingly throughout much of the film. The subtle score and expressive actors often carry the suspense, without a ton of screaming or verbal panic to convey the fear. The sets are crafted in a way that creates natural claustrophobia as the characters try to navigate the evil plaguing their home. It’s the kind of horror that creeps under your skin by disrupting one’s own notion of comfort. As a genre, horror often has a tricky relationship with the concept of exposition. The mystery of the terror is often a big part of the scare appeal, especially since the audience can substitute their own worst fears in the void of the unknown. Efforts to explain figures like Michael Myers or Jason Voorhees often fall flat as the characters are terrifying enough with only minimal backstory. Us manages to dive into the why without losing any thrills, highlighting Peele’s talent as a storyteller. He lets the audience behind the curtain long enough to get a feel for what’s happening, while preserving plenty of the intrigue. 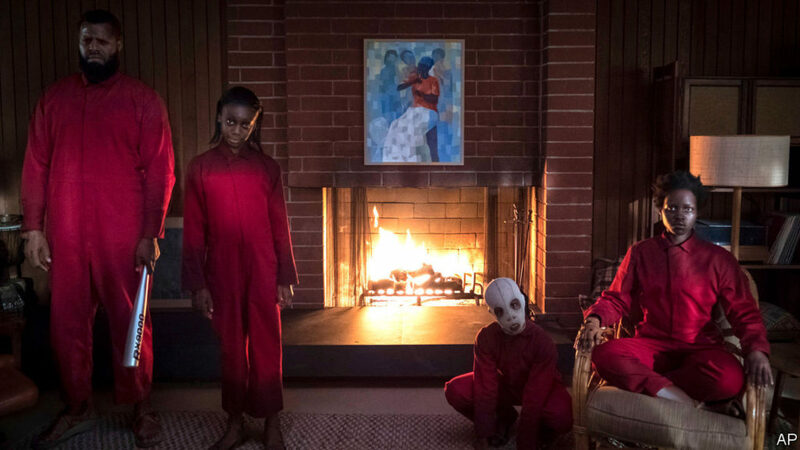 Us is a terrifying sophomore effort from director Jordan Peele, offering a thought-provoking perspective on the horror genre. Slasher movies don’t necessarily need to provide much fodder for the mind, but Peele reminds us of the power that film possesses to re-evaluate the way we think about the world. Us is the kind of movie that will thoroughly frighten you while leaving plenty of substance to chew on when the thrills have worn off.